Is there anyone in our midst who pretends to understand the awesome love in the heart of the Abba of Jesus that inspired, motivated, and brought about Christmas? The shipwrecked at the stable kneel in the presence of mystery. God entered into our world not with the crushing impact of unbearable glory, but in the way of weakness, vulnerability, and need. On a wintry night in an obscure cave, the infant Jesus was a humble, naked, helpless God who allowed us to get close to him. We all know how difficult it is to receive anything from someone who has all the answers, who is completely cool, utterly unafraid, needing nothing and in control of every situation. We feel unnecessary, unrelated to this paragon. So God comes as a newborn baby, giving us a chance to love him, making us feel that we have something to give him. The world does not understand vulnerability. Neediness is rejected as incompetence and compassion is dismissed as unprofitable. The great deception of television advertising is that being poor, vulnerable, and weak is unattractive. A fat monk named “Brother Dominic” is cute and cool because he conquers vulnerability and helplessness by buying into the competitive world with a Xerox machine. The spirituality of Bethlehem is simply incomprehensible to the advertising industry. The opening notes of Beethoven’s Fifth Symphony are being used to sell us pain reliever, and the prayer of Saint Francis is being used to sell us hair conditioner. The Bethlehem mystery will ever be a scandal to aspiring disciples who seek a triumphant savior and a prosperity Gospel. The infant Jesus was born in unimpressive circumstances, no one can exactly say where. His parents were of no social significance whatsoever, and his chosen welcoming committee were all turkeys, losers, and dirt-poor shepherds. But in this weakness and poverty the shipwrecked at the stable would come to know the love of God. Sadly, Christian piety down through the centuries has prettified the babe of Bethlehem. Christian art has trivialized divine scandal into gingerbread crèches. Christian worship has sentimentalized the smells of the stable into dignified pageant. . . .
Pious imagination and nostalgic music rob Christmas of its shock value, while some scholars reduce the crib to a tame theological symbol. 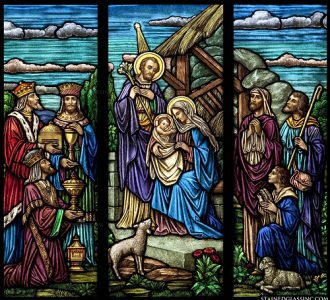 But the shipwrecked at the stable tremble in adoration of the Christ-child and quake at the inbreak of God Almighty. Because all the Santa Clauses and red-nosed reindeer, fifty-foot trees, and thundering church bells put together create less pandemonium than the infant Jesus when, instead of remaining a statue in a crib, he comes alive and delivers us over to the fire that he came to light. The man with the clear head is the man who freed himself from fantasy and looks life in the face, realizes that everything is problematic, and feels himself lost. And this is the simple truth — that to live is to feel oneself lost. Whoever accepts this has already begun to find himself, to be on firm ground. Instinctively, as do the shipwrecked, he will look around for something to which to cling, and that tragic, ruthless glance, absolutely sincere because it is a question of his salvation, will cause him to bring order to the chaos of his life. These are the only genuine ideas; the ideas of the shipwrecked. All the rest is rhetoric, posturing, farce. He who does not really feel himself lost, is without remission; that is to say, he never finds himself, never comes up against his own reality. The shipwrecked at the stable are the poor in spirit who feel lost in the cosmos, adrift on an open sea, clinging with a life-and-death desperation to the one solitary plank. Finally they are washed ashore and make their way to the stable, stripped of the old spirit of possessiveness in regard to anything. The shipwrecked find it not only tacky but utterly absurd to be caught up either in tinsel trees or in religious experiences — “Doesn’t going to church on Christmas make you feel good?” They are not concerned with their own emotional security or any of the trinkets of creation. They have been saved, rescued, delivered from the waters of death, set free for a new shot at life. At the stable in a blinding moment of truth, they make the stunning discovery that Jesus is the plank of salvation they have been clinging to without knowing it! All the time they were battered by wind and rain, buffeted by raging seas, they were being held even when they didn’t know who was holding them. Their exposure to spiritual, emotional, and physical deprivation has weaned them from themselves and made them re-examine all they once thought important. The shipwrecked come to the stable seeking not to possess but to be possess, wanting not peace or a religious high, but Jesus Christ. The shipwrecked don’t seek peace because they aren’t disturbed by the lack of it. By that I mean the subjective feeling of peace. Circumstances can play havoc with our emotions, the day can be stormy or fair and our feelings will fluctuate accordingly; but if we are in Christ Jesus, we are in peace and there unflustered even when we feel no peace. Meister Eckhart’s equation, “In Christ equals in peace,” is always valid. When we accept the truth of ourselves — shipwrecked and saved — our lives are henceforth anchored in the Rock who is Christ, not in the shifting sands of our fickle feelings. The shipwrecked have stood at the still-point of a turning world and discovered that the human heart is made for Jesus Christ and cannot really be content with less. They cannot take seriously the demands that the world makes on them. During Advent they teach us that the more we try to tame and reduce desires, the more we deceive and distort ourselves. We are made for Christ and nothing less will ever satisfy us. As Paul writes in Colossians 1:16, “All things were created by him and for him.” And further on, “There is only Christ: he is everything,” (3:11). It is only in Christ that the heart finds true joy in created things. The shipwrecked stand on firm ground. They live in truth and are rooted in reality. They do not allow the world to order them around. Kneeling at the crib they find the vanity of the world ridiculous, bloated, preposterous. . . .
Do you hear what the shipwrecked are saying? Let go of your paltry desires and expand your expectations. Christmas means that God has given us nothing less than himself and his name is Jesus Christ. Be unwilling next Christmas to settle for anything else. Don’t order “just a piece of toast” when eggs Benedict are on the menu. Don’t come with a thimble when God has nothing less to give you than the ocean of himself. Don’t be contented with a “nice” Christmas when Jesus says, “It has pleased my Father to give you the kingdom.” Pray, go to work, play Trivial Pursuit, eat banana bread, exchange presents, go caroling, feed the hungry, comfort the lonely, and do all in the name of our Lord Jesus Christ. As Christmas approaches, an honest question is: do I want to be or merely appear to be a Christian? Like the shipwrecked, the Enchanted One is laid waste by one pure passion. His singlemindedness leads him to a realistic assessment: anything connected with Christmas that is not centered in Christ Jesus — tree, ornaments, turkey dinner, exchange of gifts, worship itself — is empty gesturing. Blessed are the shipwrecked, for they see God in all the trappings of Christmas and experience a joy that the world does not understand. “Leo, listen carefully to me. Don’t be so preoccupied with the purity of your heart. Turn and look at Jesus. Admire him. Rejoice that he is what he is — your brother, your friends, your lord and savior. That, little brother, is what it means to be pure of heart. And once you’ve turned to Jesus, don’t turn back and look at yourself. Don’t wonder where you stand with him. “The sadness of not being perfect, the discovery that you really are sinful, is a feeling much too human, even borders on idolatry. Focus your vision outside yourself on the beauty, graciousness, and compassion of Jesus Christ. The pure of heart praise him from sunrise to sundown. Even when they feel broken, feeble, distracted, insecure, and uncertain, they are able to release it into his peace. A heart like that is stripped and filled — stripped of self and filled with the fullness of God. It is enough that Jesus is lord. When Jesus tells us to become like little children, he is urging us to forget what lies behind. Children have no past. Whatever we have done in the past, be it good or evil, great or small, it is irrelevant to our stance before Jesus. It is only now that we are in his presence, and this Christmas is the First Christmas of the rest of our lives. Like little children, the shipwrecked don’t bring the baggage of the past into the stable of the present moment. . . . I wonder, if we were to stop people at random in the street on December 24 and ask them what they want most for Christmas, how many would say, “I want to see Jesus”? The only explanation of why the little bank of the shipwrecked exists at all is the personal magnetism of Jesus. As Bernard of Clairvaux wrote, “Only he who has experienced it can believe what the love of Jesus Christ is.” You could more easily catch a hurricane in a shrimp net than you can understand the wild, relentless, passionate, uncompromising, pursuing love of God made present in the manger. In their integrity the shipwrecked preserve the meaning of Christmas in its pristine purity — the birthday of the savior and the eruption of the messianic era into history.